The 63-year-old actress has lamented the ubiquity of sleeveless styles, which are great for young women, but alas not ladies of her age. 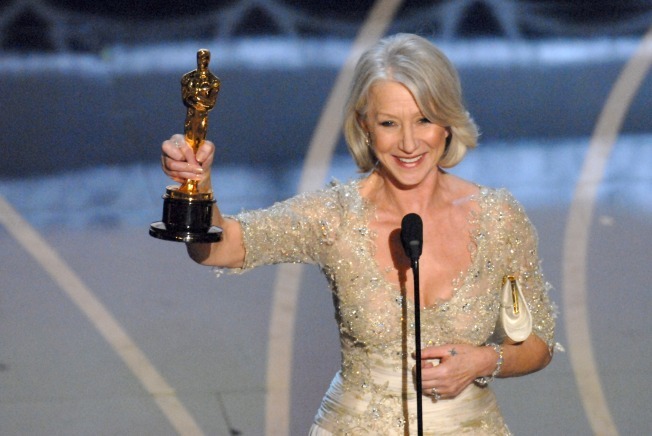 Dame Helen Mirren might design a collection for Marks & Spencer. The 63-year-old actress has lamented the ubiquity of sleeveless styles, which are great for young women, but alas not ladies of her age. Helen replied, "Oh yes," when asked if she'd accept an offer to do the line, adding that she'd call it "DWS: Dresses With Sleeves." Her comments prompted Sir Stuart Rose, Chief Executive of Marks & Spencer, to suggest he would consider launching such a range. "She is a very stylish lady," he said. "I once sat next to her at lunch and I remember her even if she won't remember me. Her's [sic] is a very interesting concept and we're always interested in new ideas so let's see what happens." Funny, we didn't think sleeves or designing for ladies of Mirren's age were new ideas, but it speaks volumes that retail executives do. The fashion industry has ignored older women for too long, which makes very little sense considering it's not as if they don't wear clothes. Older men made a resurgence on the runways during the last round of men's shows, so why shouldn't their female counterparts step into the spotlight with them? With Jerry Hall as the new face of Chanel handbags, older ladies appearing in Dolce & Gabbana's resort ads, Lauren Hutton as the new face of Elizabeth & James, and Mirren's potential line, the trend seems to be percolating. What’s This? Neiman Marcus Posts $12.9 Million Profit?